Our own research supports these findings. Radware’s 2018 Consumer Sentiments Survey found that 55% of U.S. consumers stated that they valued their personal data over physical assets, i.e. cars, phones, wallets/purses. 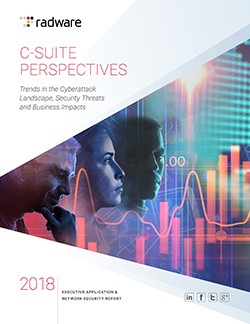 In addition, Radware’s C-Suite Perspectives report revealed 41% of executives reported that customers have taken legal action following a data breach. Consequences of data breaches have extended past bad press, and include lasting effects on stock prices, customer acquisition costs, churn, and even termination of C-Suite level executives. Types of sensitive data vary by industry and therefore have respective attack methods. For example, the finance and commerce industry are expected to protect data such as names, contact information, social security numbers, account numbers and other financial information. Likewise, the healthcare industry is at high risk of data breaches, as medical records contain the same personal data in addition to more details that aid in identity fraud – such as doctor and prescription records, medical insurance information, and individual health attributes from height and weight to blood type. On the surface, data breaches fall under the jurisdiction of CISO, CTOs, etc., but CEOs are now just as likely to be held responsible for these incidents; Target’s then-CEO was forced to resign following its 2013 data breach. Other CEO’s at Sony and Home Depot were no longer in their positions within 6 months of their high profile breaches. Laws and regulations surrounding data breaches are now moving at a faster pace due to steeper consequences, with the implementation of the European Union’s General Data Protection Regulation (GDPR) and the United States’ growing interest and demand in data privacy and protection. Security at its bare minimum is no longer realistic, and instead a competitive advantage for smart companies. C-level executives who aren’t reviewing security plans are opening themselves and their companies to significant liabilities. The GDPR’s purpose is providing protection over the use of consumers’ personal data. Companies are now held to a higher expectation to protect their customers’ data, further emphasizing the evolving consideration of cybersecurity as a necessity in business. At its strictest, companies found not having done enough can be penalized upwards of €20 million or 4% of the offending organization’s annual worldwide revenue. Although data breaches alone are months of bad publicity in general, the wrath of consumers often stem from the delayed notification and response from the company. Companies incur this fury when they attempt to keep a data breach hidden only for it to be uncovered, resulting in increased litigation costs. The GDPR now mandates and upholds companies to the high standard of notifying data breach-affected consumers within 72 hours. In 2013, one of the most notable, mainstream headlines focused on the data breach of Minnesota-based, retail giant Target Corporation. During the holiday shopping season, Target revealed their mass data breach of personal information, of which 40 million customers had personal financial data stolen and 70 million had general personal data (such as email and addresses) revealed. Attackers were able to exploit the company’s customer database through a third-party vendor’s stolen credentials, utilizing malware as the weapon of choice; the same malware was later utilized to attack other retailers such as Home Depot. Hackers after the finance and retail industry still utilize malware like Target’s 2013 data breach to create pathways from minimally-protected 3rd parties into more complex systems. At the end of the investigation, Target had to pay a fine of $18.5 million across the U.S. in addition to its cumulative legal fees of a staggering $202 million for the data breach. What goes unmentioned however, is also the potential cost of lost customers from these breaches, as well as the brand reputation decline. The company must also abide to new Terms of Agreements by various State Attorney Generals that include requiring Target to employ a security leader for the creation and management of a thorough information security program, in addition to other related guidelines. Target became a lasting example of the need for cybersecurity to be implemented within a company’s architecture and business processes. The topic of protecting customer data has become its own high-profile discussion across various industries, rather than just within the technology industry. Being proactive with not only the security surrounding the company’s products/services, but also the data it collects, will be a competitive differentiator moving forward. Radware research found that 66% of C-Suite Executives across the world, believed hackers could penetrate their networks, yet little is changed to implement protections as exhibited by the graphic below. Sensitive data across all industries are valuable, coming at different prices in the dark net market. As data breaches are becoming more commonplace, industries have to take different levels of precaution in order to protect consumers’ personal data. For example, the healthcare industry heavily utilizes encryption to protect data such as medical records and prescription history. However, attackers are also implementing encryption attack tools in order to access this information. It is crucial for the cybersecurity systems of these organizations to be able to distinguish between valid encrypted information versus attack information encrypted with SSL, in order to prevent a breach. A comprehensively designed network infrastructure that consistently manages and monitors SSL and encryption technology through its security systems can ensure protected network and data privacy. Transitioning cybersecurity from the hallways of IT and embedding it into the very foundation of business operations allows an organization to scale and focus on security innovation, rather than scrambling to mitigate new threats as they evolve or worse, litigating expensive class actions. In addition, this proactive approach further builds customer relationships via improved trust and loyalty. Knowing that cybersecurity is a company’s and CEO’s priority will help the customer feel more at ease with potential partnerships and strengthens the level of trust between. Radware fends off thousands of attacks on a daily basis, resulting in thousands of satisfied customers around the world. However, the evolutionary nature of the cyberattack threat landscape requires every defender to adapt to changing attacks that are continually increasing in frequency and complexity. Realistically, attackers need little knowledge or money to be effective. They can launch attacks via user-friendly tools and services made available via a prospering hacker community. This underground economy is blooming and innovative, with research and competition driving attackers and their tools to new heights. Protecting against these evolving threats is a perpetual effort and breaches have become an unfortunate reality. Radware is focused on staying ahead of the threat landscape through dedication, technology advancement, and most of all, through the partnerships we build with our customers. It’s through our day-to-day collaborations, that we learn from our customers and further our technological capabilities in order to mitigate even the most advanced attacks. Radware values these long-term partnerships because they bring us innovation from real-world experiences and strengthen our defenses for the global community and greater good. Let’s keep up the good fight, together! In a recent Light Reading webinar, Principal Heavy Reading Analyst Jim Hodges and I discussed the growing need for Managed Security Services. DDoS attacks are becoming increasingly sophisticated and complex, lasting more than 24 hours in some cases. The attacks aren’t limited to specific industries or company sizes anymore, and push stretched internal IT resources to the breaking point. The 0s and 1s that flash through service provider networks are equally vulnerable. Attackers don’t care where the data is coming from…they’re looking for vulnerabilities they can exploit for money. The days of hacks focused on large retail organizations like Target and Home Depot are behind us. Merck and Co., a large U.S.-based pharmaceutical firm, was one of several global companies impacted by a massive global attack. Don’t let these hacks bring your customers’ network down. You know how when you get to a certain age, feeling ‘good’ is not good enough? Well it might be good for your everyday life – obviously, you don’t need to extract the most out of your brain and muscles for the day-to-day to-do’s, but there is no guarantee that there is nothing there that negatively impacts your performance, or may be silently growing. Every year Radware sets forth predictions in our annual security report called Radware’s Global Application and Network Security report and, we might add, have achieved a very substantial track record of forecasting how the threat landscape will evolve. After all, it is fun to predict what may happen over the course of a year in security. The industry moves so fast and while some things do stay the course, it only takes one small catalyst to spark a new direction that nobody could have predicted.